As we stood in line waiting for our turn on the Rockin' Rollercoaster, we heard the announcement, "This ride DOES go upside down." M's head whipped around toward me and her eyes were HUGE! I had just told her that I didn't think it went upside down - at least I didn't remember that it did. It was the one thing that would have prevented her from going. She did NOT want to go upside down! I couldn't help but laugh and asked what she wanted to do. She was torn. The event had been built so high in her mind that she didn't want to NOT go. And she kept commenting about how her brother would be proud of her if she rode it. And so we rode ... 3 times! Screams and laughter were part every round. 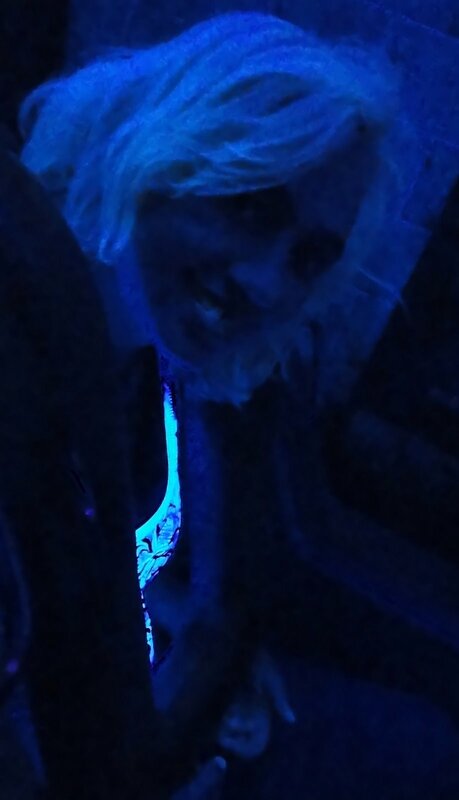 She was positively glowing (and not just from the black lights in the ride)! I'm glad my memory failed me. It helped Miss M become a coaster lover! Now THAT'S special.